I have been to the following countries: Canada, Thailand, America, Pakistan, China, Australia. And i have traveled to countries like: Japan, Canada, Thailand, Pakistan, Barbados, Dominican Republic, Bermuda, and many others. Hey everyone! 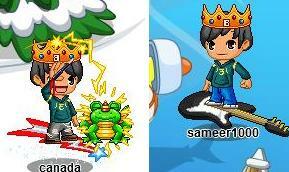 I am Canada and my fantage username is canada. I started playing fantage in march 2008 during the beta test. You can usually find me at downtown in the server White Seal. My fav food is also chocolate!!!!!!!!!!!!! wow u have traveled to so many amazing places where did u get all that money i mean REALLY!!! sarah i saw u once u were nice anywayz toddles! sameer,your brothers cheat site is gone.what happened to it? hey i see you alot dude. chocolate! o and im on white seal everyday and sometime want to be buddies? Hey pepoles i teling you ill be on white seal today at 7:54 ok? im gabriella99 and i will be on down town . my user name is jenny1197 omg i love you so much CHOCOLATE ROCKS lol.If any of you quit playing fantage go to maplestory.com and download it plz!!!!!!!!!!!!!!!!!!!!! tries to add u say yes!!! and then we can talk and be good friends! okay bye! oh sorry forgot to put sameer 1000 accidentally put sameer100. anyways forgot to ask u an important question. r u chaldean or arabic? cuz sameer is a total chaldean name! i would know cuz i’m chaldean. Hey I like your website but can you tell us how to be bald on fantage? Hey… IM TOTALLY COMIN TO UR PARTY! IM A BIG FAN OF UR SITE! nice website is very cool i wish i could make 1 but i cant. I love chocolate too is my faverite sweet chocolate is soooooo awesome i buy it every day with my pocket money i only get £5 every friday.byeeee everyone i hope u enjoy reading wat i wrote. Sameer1000 i hope u notice me when i see u im a big fan of urs sooooo add me straight away when u see me. Sameer I’m From Dominican Republic P.S. The 200,000 Hits Party Was The Best!!!!!!!!! Hey sameer i seen u last time im a fan of ur site too. I aded and said hi. if u did not ad me its ok but a hi bak would b fine to me plz reply. I hope i c ya later. Jack are like my favorite ppl on fantage ( b/c they r famous ). At first I thought you guyz were the ones who made fantage for a second but, then I figerd out that there’s other ppl who made this. Everyone on fantage rocks but, memberz to me ( but u guyz =] ).Members act populer on fantage.I used to be a member but, now im a non b/c they took it away from and im like ” WHAT THE HECK ”. I was so mad b/c I thought ppl wern’t gonna treat me the same then they used too but, Jack used to be a member I think and he still has friends. Im guessing is that he is a guy/dude lol. It gets really annoying how girls dont get boyz when they are non memberz. Thatz why! hope to c yeah round dude…..